Green, in a variety of shades, was the color of choice for the US Military during the Vietnam War. Green helmets, green helicopters, green cans of ham and lima beans, and of course green uniforms were all designed to blend in with the sometimes overwhelming jungle. There were some exceptions, however, to this rule of green. Purple smoke grenades and eye popping pink signal panels identified friend from foe from the air. There were times when bright colors could save a GI’s life. Mail, that all important link to home, also came in colors during Vietnam. Red, yellow, and orange mail bags were especially designed to stand out against all that green and make the mail easier to keep up with while in transit. It is not that the US Military and US Postal Service did not try to join forces and make delivering mail to front line troops green as well. 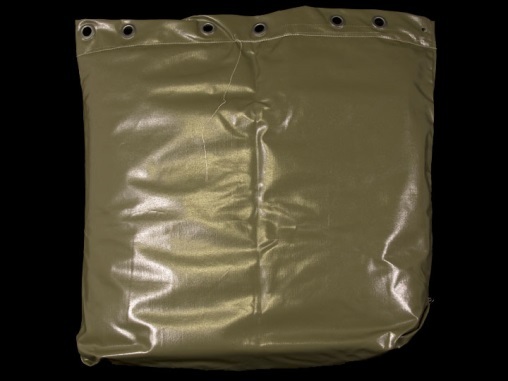 A well-intentioned but failed experiment was the design of olive drab mail bags intended to be dropped from helicopters. They worked well, too well. It must have seemed completely predictable in hindsight, but during test drops the bags ended up blending in with bushes and grass and could not be found. It was decided that colorful mailbags were worth the camouflage risk if they got the mail delivered. 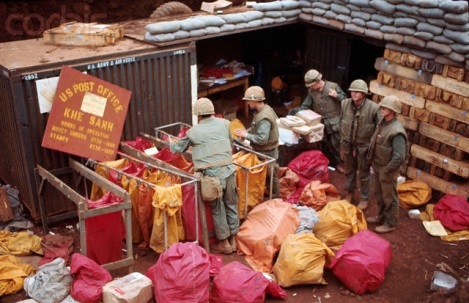 Many who served in Vietnam still recall those vivid mailbag colors. Jimmie Stephens (Tactical Operations Center, 1st Bde, 4th ID, 12/69-11/70) remembers, “Bags full of smiles, tears, laughter and sometimes heartbreak. Millions of bits of individual moments of reality ‘back in the World’ within those crimson and canary colored pouches.” Of those that made it out to the field, the most common mailbag color was red, really more of a magenta. If you look closely at color photographs taken during resupply or down times during the war you might be surprised at how often you see the telltale splash of the color of a mailbag. Sometimes Hollywood gets the small things right. 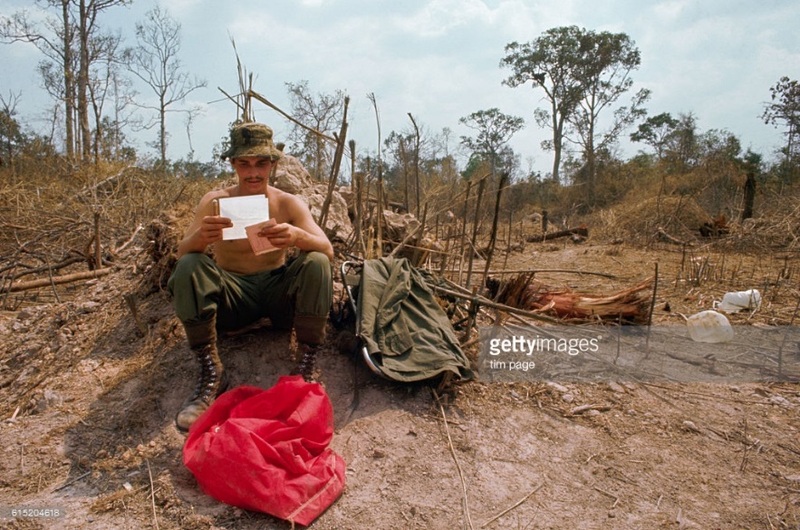 When Forest Gump and Bubba are dropped off to their unit in Vietnam, a red mailbag gets tossed out right behind them. A detail most likely lost on all but the vets who were there. One thing remains the same for generations of service men and women deployed overseas, mail was, and is, their tangible link to home. Even in our era of email and Skype, there is still something special and uplifting about a handwritten letter or care package. One of the many things that made the Vietnam experience unique was the way mail was delivered. 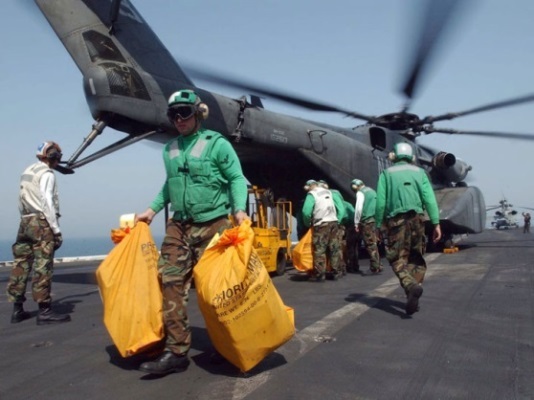 There is little doubt that the sight of those colorful bags tossed out of a Huey must have caused some hearts to beat a little faster, hoping for a letter or package from the World.